Since I will be building a sleeping platform in the bed of the Toyota Tacoma, I need to dust proof it. I realized how much dust gets into the bed of the truck pretty quickly by driving many miles of dirt roads with the tonneau cover attached. One look inside and everything was covered in dust. The tailgate seal I used below is the Ultimate Tailgate Seal available on Amazon. There are three drain holes near the cab side of the bed. These are great to have if you have water in the bed of the truck. But my bed will be covered. So these need covered to keep dust and moisture out of the bed. Black duct tape to the rescue! Simple, inexpensive, and should work. The right side storage compartment in the bed of the Tacoma has drain holes in the back and large holes for the hinge of the cover. This allows too much dust into the bed. I covered the drain holes with black dust tape. The hinge holes are covered with insulated adhesive which I sliced with a knife to allow the hinge part of the cover to pass through. The large storage compartment in the bed of the Tacoma is dust proof the same way. Black duct tape covering the drain holes, and insulated tape covering the hinge holes. Getting ready to apply the tailgate seal to the Toyota Tacoma. The ultimate tailgate seal applied around the edges of the Toyota Tacoma tailgate to keep dust and moisture out. 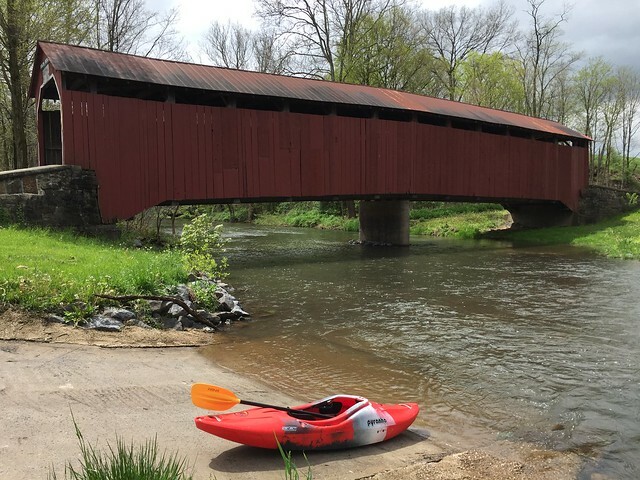 I had the opportunity to kayak the west end of the Shermans Creek in Perry County, Pennsylvania today with some friends. To many, this creek is no big deal. But it holds a special place in my heart because I grew up just a few hundred yards from the Shermans Creek. There wasn’t much to do in the small town of Center. Yet it seems I was always busy running around outside and exploring the world. Because that’s all I had. During the Summer I would be swimming in the Shermans Creek. The Winter meant ice skating on the creek. 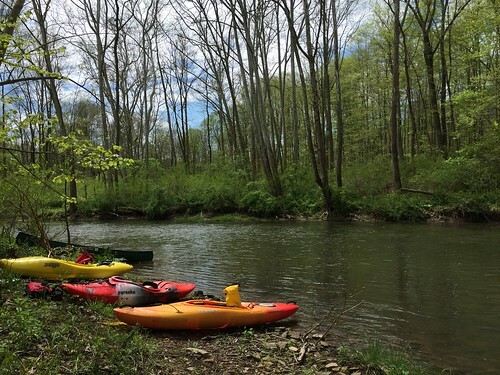 During the Spring and Fall I would meander through the woods looking at the creek and fantasize about having a boat and the ability to float along with the current. 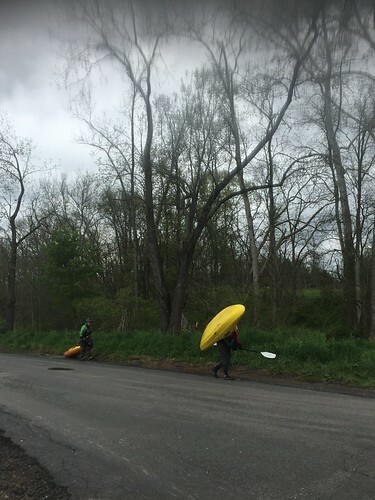 What seems to be a lifetime later, I now own a kayak and found friends who share the same desire to explore the creeks and streams of Pennsylvania. Today, as I paddled down the stream, I looked around at the cliffs and woods that surround the Shermans Creek, and I pictured myself as a young boy roaming along the banks looking out at me as I float by. The Shermans Creek water level was right around 2.5′ on the Shermans Dale water gauge today. 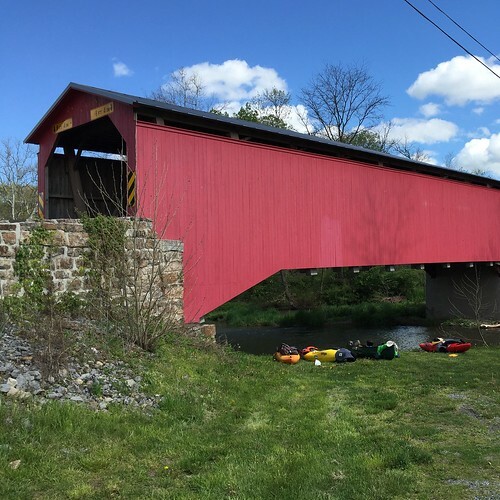 The trip took us approximately 4 hours from the Enslow covered bridge to the Adair covered bridge with a lunch break and 3 portages (2 portages around fallen trees and 1 around a low concrete bridge). There are about 4 play areas for surfing along this section. Though there was some scraping the bottom, the level was decent for this trip. As 2013 comes to an end, I will reflect on the year as I see everyone else doing the same. It just seems so cliche. But, here goes. It has been the most difficult year I’ve experienced in my adult life. Losing my job, trying to find health insurance, job hunting, becoming an adult student, finding part-time work, and many personal struggles. My house was burglarized, my car was involved in a hit-and-run, and I ran out of fuel oil during a very cold night. The year seems to be completely overshadowed by negative experiences. But maybe that is what living is all about. It’s about the hardships and pain you go through in search of enlightenment. On the bright side, I was able to spend several days on a beach in the U.S. Virgin Islands with people who I haven’t seen for probably 25 years. Family members finally helped me find my heritage. I made many new friends this year including several who are new co-workers. These things would not have happened if it was not for the pain and struggles I experienced. I just wish there would be a few more positive events to reflect on. Of course I hope 2014 will be an amazing year. But it will come with struggles. That is guaranteed. I can only wish that it is more balanced with rewards than 2013 was. Many years ago I heard a saying. It went something like this: “In order to be successful, you need to be willing to make sacrifices. What sacrifices are you willing to make in order to be successful?” Well, I’ve made a lot of sacrifices. Still waiting for some success to come my way.